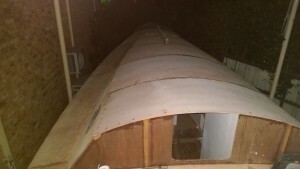 The first layer of 6 mm plywood on the cabin top is completed so here is a photo taken after dark. The beam on top of the cabin is a deep section of LVL which is keeping the front edge of the cabin top straight while the glue is curing on extra layers of reinforcement underneath. The extra layers of 6 mm plywood reinforcement are held on place with temporary screws from below up into the smaller strips of timber on the front of the cabin top. 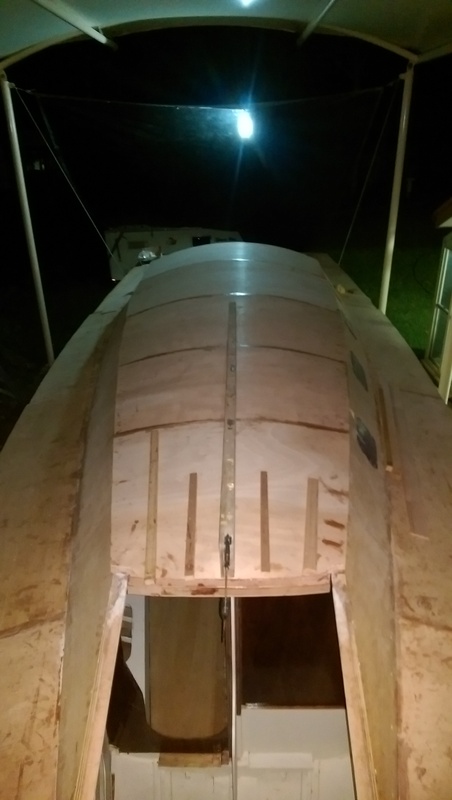 After the photos I added a couple of temporary timber stringers to the cabin top on both sides of the companionway to keep the deck as straight as possible while the glue cures. I will add two layers of 6 mm plywood under the deck on each side of the companionway to take the load of winches. Once the glue on these is cured the last layer of 6 mm ply will be added over all the cabin top and then I will be able to cut out the top over the companionway. Until then it is a bit of a wriggle to get into the hull through the small opening.